EDEN NATURE PARK, CALINAN DISTRICT, DAVAO CITY (October 25, 2018) — It was a heart-to-heart conversation between one journalist to another. 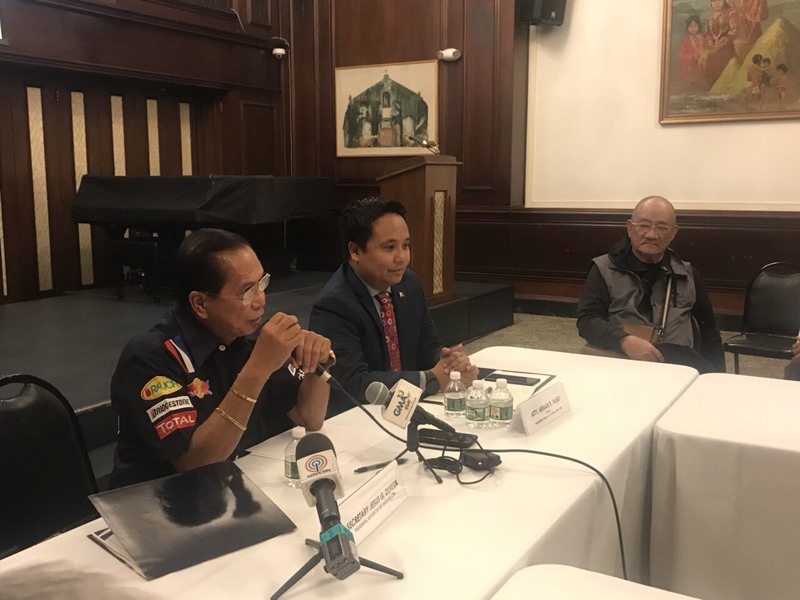 For about two hours, Presidential Peace Adviser Jesus Dureza listened, laughed, and exchanged views with members of media coming from various parts of Mindanao on a range of issues and concerns. It was a candid dialogue as the government’s top peace negotiator shared his experiences as a neophyte reporter of a local daily and then moving up as editor-in-chief and finally as publisher of the paper. But Dureza’s message to his media colleagues was strong and clear: Serve as beacons of free speech and champions of truth and justice. 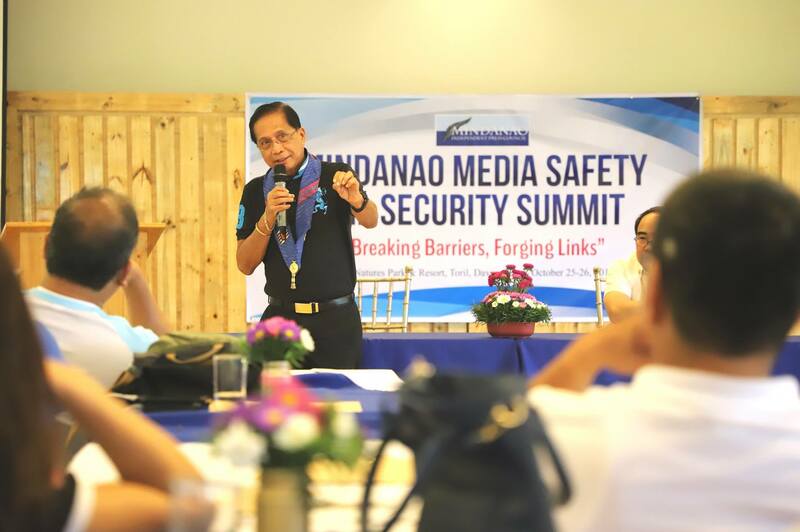 “You must help create an enabling environment that is conducive to free speech,” he told the more than 50 journalists attending the Mindanao Media Safety and Security Summit organized by the Mindanao Independent Press Council (MIPC). Dureza recognized the many challenges confronting the profession, particularly those who are working in conflict-affected areas in the country. “A lot of you operate in critical areas. But you have to make sure that the environment (for free speech) is there,” he said. Dureza said being the Fourth Estate, the media should not cower in fear and be easily intimidated by the forces that threaten them. He narrated an incident which tested his commitment as a journalist and advocate of truthful and accurate reportage. But the unfortunate event did not deter him from filing his story and instead inspired him to stand by his principles as a journalist. “Should we be threatened? As journalists, we need to uphold our principles at all times,” Dureza said. 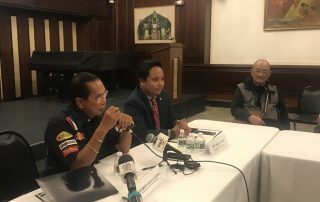 “You always need to look after the truth,” Dureza said, adding that journalists need “to go beyond” the information their sources provide them and validate their veracity. The Peace Adviser, however, advised media to take the necessary steps to ensure their safety, especially if their lives are in danger. “You have to find a way to protect yourself. If not, you will be constrained in telling the truth,” he said. Dureza also challenged members of the media to use their pens and microphones as instruments to amplify the concepts of understanding, unity, and peace among the Filipino people. In particular, he asked journalists to help the national government in addressing the “larger peace table,” which is the general public. “You are the ones addressing the larger peace table 24/7. Your audience number in the thousands,” he said. 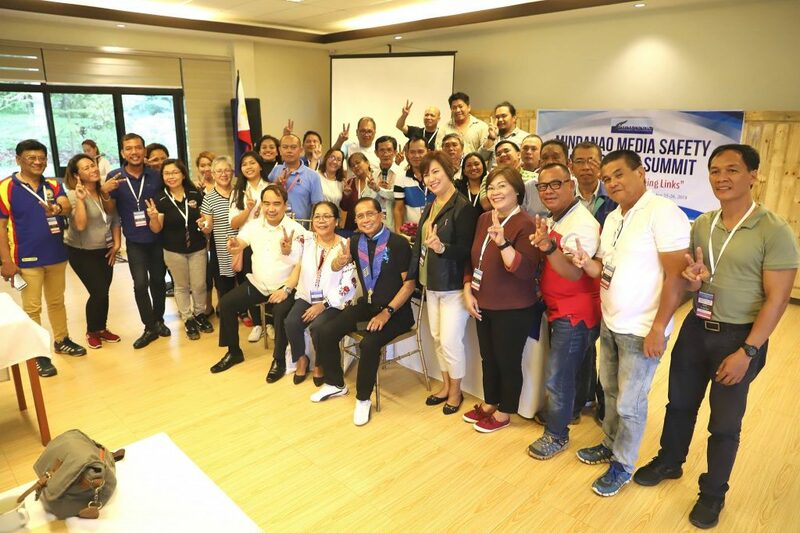 Dureza said the media can play a crucial role in helping to bridge the social, religious, and cultural divide among the people and heal the social fabric that had been torn in situations of conflict. 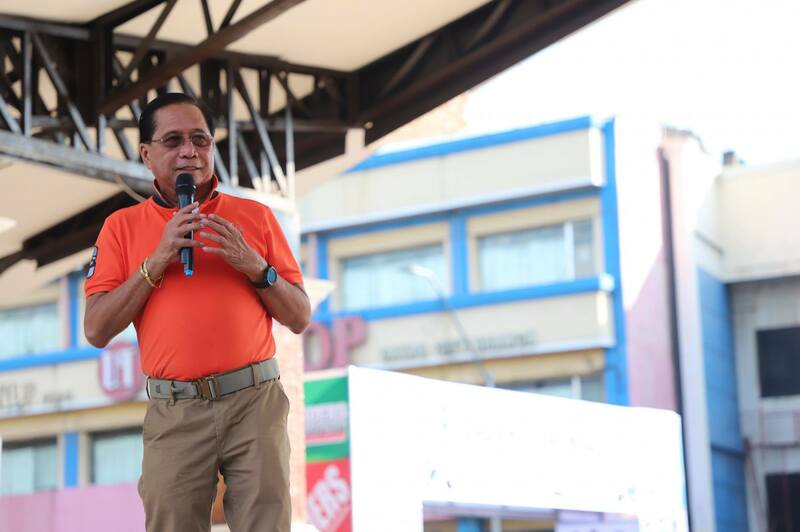 Citing Marawi as an example, Dureza admitted that restoring relationships in the community is more difficult than rebuilding the physical infrastructure that was destroyed during the five-month war. He said media reports should support multi-stakeholder efforts that would allow just and lasting peace to firmly take root, especially in communities situated in areas of conflict. “Your messages should help create that conducive environment,” Dureza said. 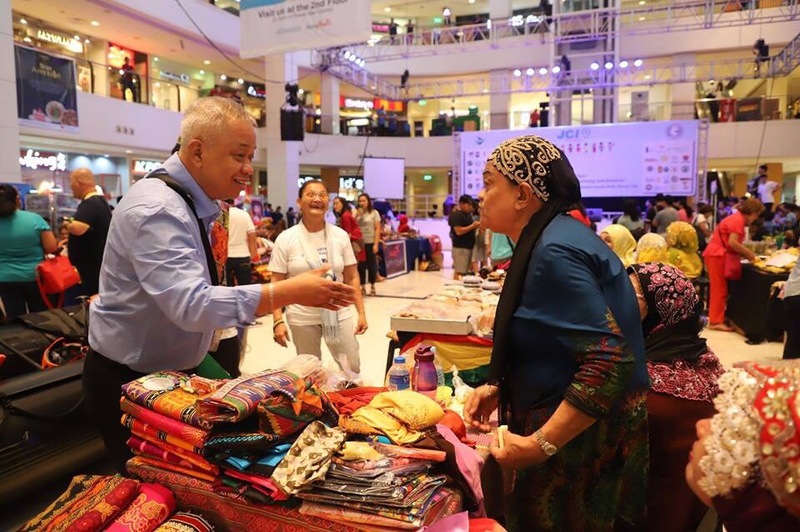 This was the message of Bangsamoro Transition Commission (BTC) Commissioner Jose Lorena Jr. during the closing ceremony of the Multicultural Peace Fair Bazaar at the Abreeza Mall here in Davao City last September 13. Lorena said the gains of peace should not just benefit a particular sector or group but everyone, regardless of ideology, tribe, or religion. He said the Duterte Administration’s Peace and Development Roadmap is anchored on the principles of inclusivity and convergence. “There should be inclusivity and convergence in all our initiatives. One sector cannot do it alone,” he said. Lorena said it is President Duterte’s vision to see all Filipinos united and rallying behind the national government’s peace and development agenda. He said this is the reason the Office of the Presidential Adviser on the Peace Process (OPAPP) is strengthening the “bigger peace table” or the general public. “Let us all set aside our differences and work together. It is time for us to achieve the peace and development we have long been aspiring for,” he said. 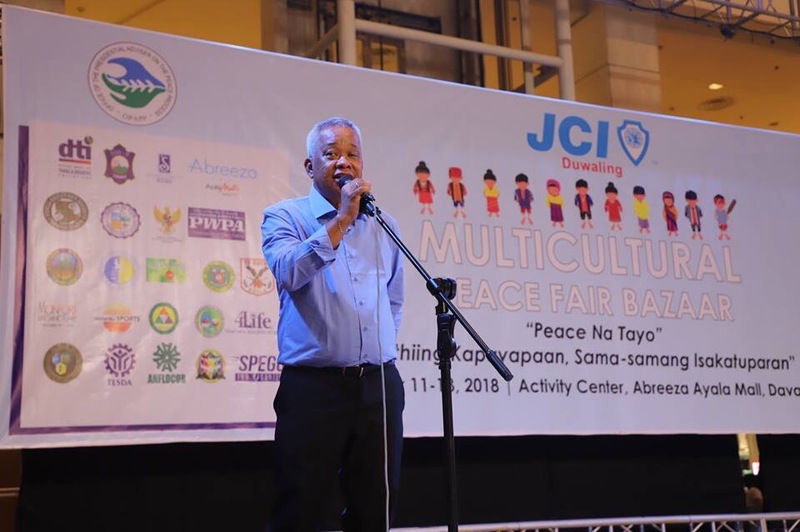 The three-day peace fair, which kicked off on September 11, was organized by OPAPP, Mindanao Peace Council, and JCI Duwaling. PASAY CITY, September 13, 2018 – The Office of the Presidential Adviser on the Peace Process (OPAPP) today presented the roadmap for the crafting of the National Action Plan for Youth, Peace, and Security (NAPYPS) during the first day of the National Youth Peace Table Summit being held in this city. 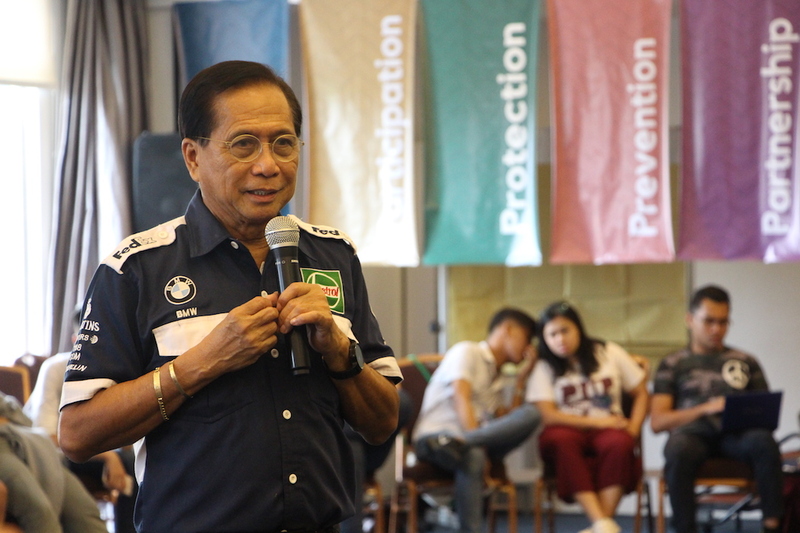 In his message, Presidential Peace Adviser Jesus Dureza expressed pride in the peace initiatives of the 80 young participants, saying these will be integrated in the promotion and institutionalization of peace. “We are hoping that this group of yours will become a nucleus of what could be a very capacitated group that could eventually already establish your own peace tables in your communities. Your work now is just really to share the skills, the capacity, and invite the support that you need,” Dureza said. “That is the reason we provide whatever support that is needed in your big work ahead,” he added. The upcoming NAPYPS is in response to United Nations Security Council Resolution (UNSCR) 2250 which recognizes the youth’s efforts in peacebuilding and provides a set of guidelines upon which policies and programs will be developed by member states, the UN, and civil society. The NAPYPS will be based on the OPAPP Youth Peace Table’s (YPT) series of nationwide consultations with different youth organizations. It will support the Filipino youth’s positive contribution to the peace process and conflict-resolution initiatives. 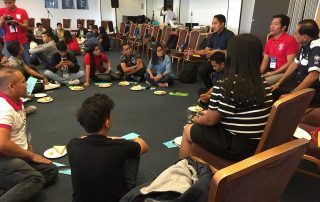 Since 2017, OPAPP has been partnering with young leaders from various regions involved in peacebuilding to gather their recommendations and insights in the drafting of the youth peace agenda. The partnership is also aimed at deepening the youth leaders’ appreciation of peace education and sowing the seeds for a new roster of peace leaders. OPAPP Conflict Prevention and Management Director Ferdinand Jovita said the event is “not just a commemoration” but a challenge to the youth on how they will apply the youth programs in their lives. “A document is just a manifestation of what we have, but the real thing is how these formulated pillars will be lived by the youth of the Philippines,” he said. OPAPP’s YPT is a partnership with the United Nations Development Program, together with the National Youth Commission, Teach Peace Build Peace Movement (TBPBM), Miriam College’s Center for Peace Education, Generation Peace, and Peace Tech. 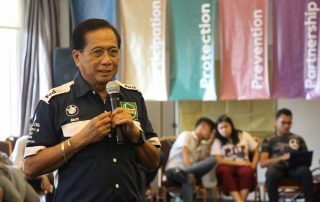 PASAY CITY, September 13, 2018 – Presidential Peace Adviser Jesus G. Dureza today urged the youth sector to help address the triggers of conflict to achieve lasting peace in the country. 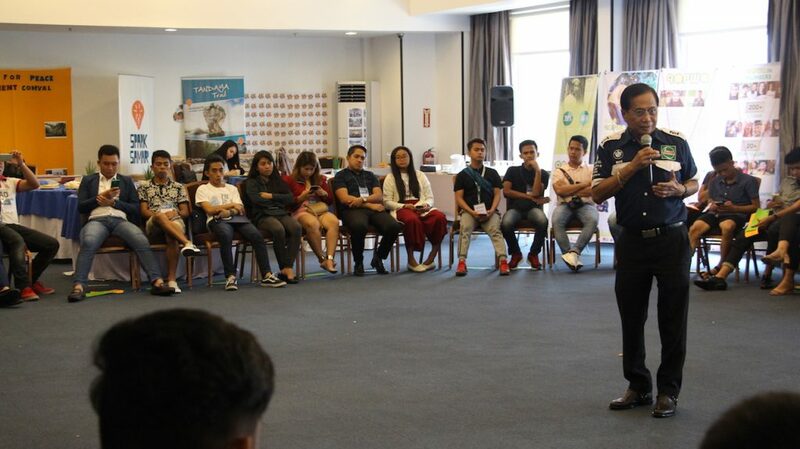 Speaking to delegates at the opening the three-day National Youth Peace Table Summit being held in this city, Dureza said youths’ knowledge of the context of conflict in their respective areas is vital in the peace efforts of the government. “You came from different areas, iba-iba ‘yung triggers of unpeace. Ang trabaho natin as youth, we need to address this,” he said. 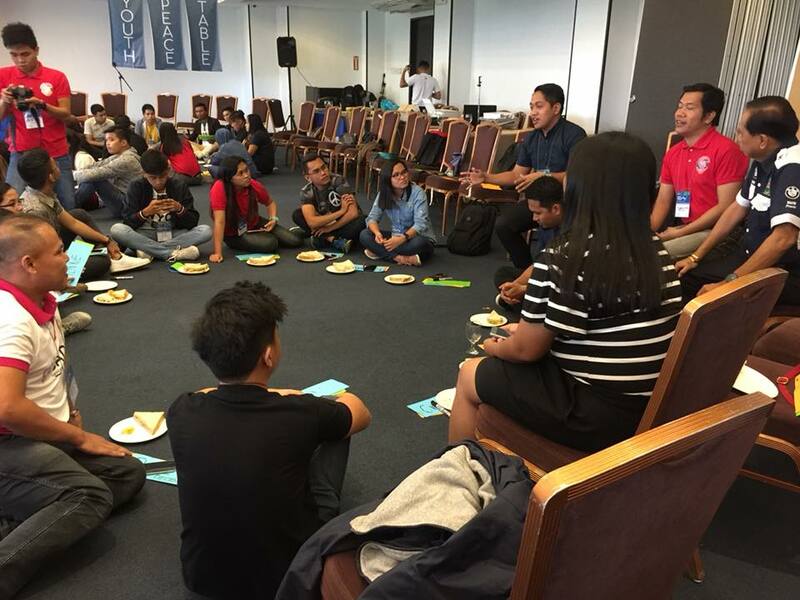 Eighty selected youth leaders from previous summits in Luzon, Visayas, and Mindanao are participating in the summit. 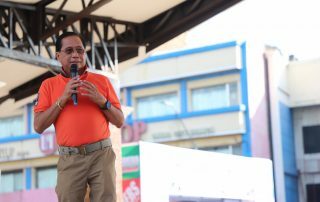 Dureza said the gathering can serve as a platform in which to share ideas to promote peacebuilding in the communities. “The action plan (that will be crafted in this summit) must be specific to the area where you came from,” he added. 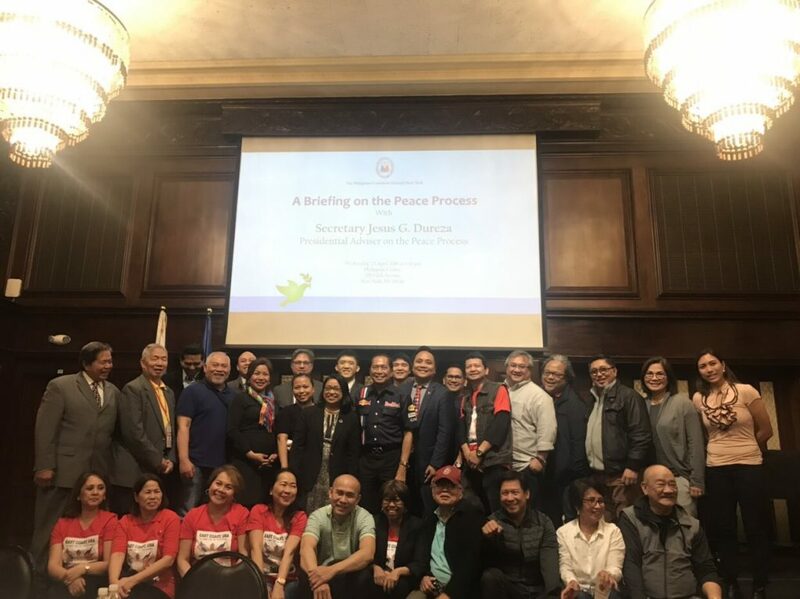 Dureza also challenged the delegates to expand peacebuilding in their own communities, saying they have a big role to play in advancing change in the country. 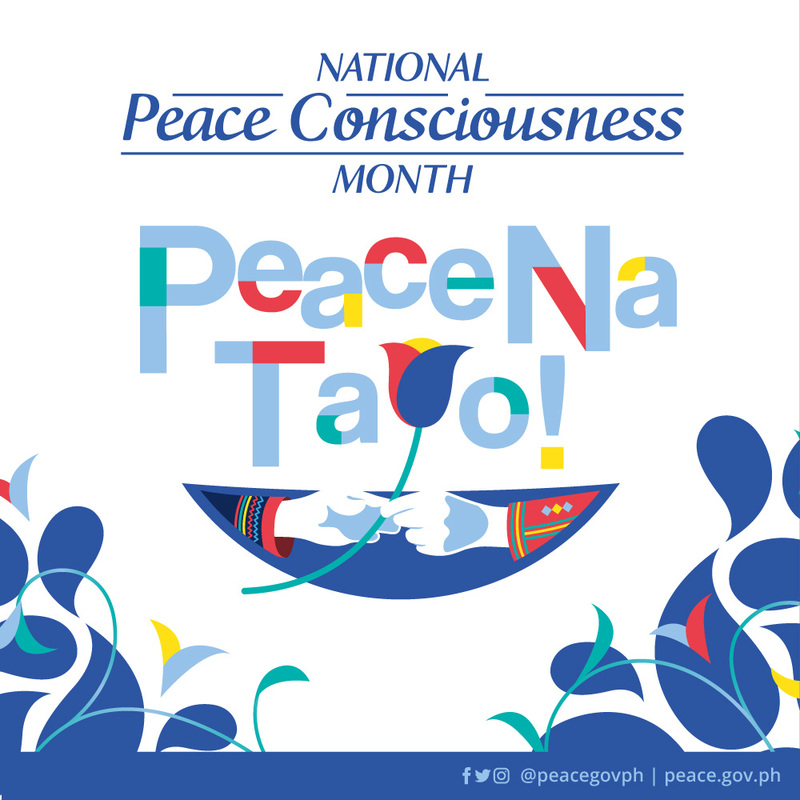 PASIG CITY, September 2, 2018 – The Office of the Presidential Adviser on the Peace Process (OPAPP) and partner advocates all over the country are leading the celebration of National Peace Consciousness Month this September. With the theme, “Mithiing Kapayapaan: Sama-samang Isakatuparan,” the month-long celebration calls for a unified action towards the shared aspiration for a just, comprehensive, and enduring peace regardless of ideology, religion, and culture. 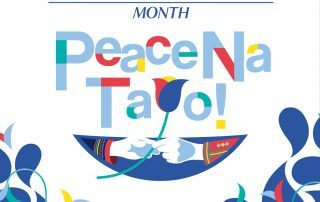 The carrier tagline of this year’s Peace Month is “Peace Na Tayo,” a simple way to communicate the theme’s call for a participative pursuit for peace. “Ang trabaho para sa kapayapaan, hindi lamang para sa apektado, dapat lahat tayo, nasa peaceful area man or labas ng fragile communities, sasama tayong lahat para sa pinapatunguhan nating kapayapaan,” Presidential Peace Adviser Jesus G. Dureza said in his message for Peace Month. Dureza also noted that it was unity that brought milestones in advancing peace in the country. “Hindi lang ito dahil sa OPAPP, hindi lang dahil sa Pangulo. Ang daming tulong galing sa taumbayan.” he added. September of every year is National Peace Consciousness Month as declared by Proclamation No. 675 issued in 2004. The same proclamation mandates OPAPP to be the lead government agency to coordinate and monitor its observance. The formal celebration of Peace Month will begin with the ringing of the Peace Bell at the Quezon City Memorial Circle on Monday, September 3, 2018. 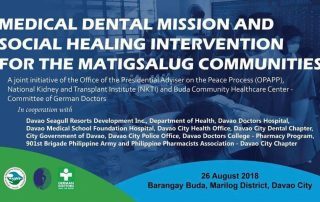 MARILOG DISTRICT, Davao City (August 25, 2018) — Around a thousand members of the Matigsalug tribe are expected to gather at a local infirmary here tomorrow to avail themselves of free health and social services offered by government and private sector institutions. 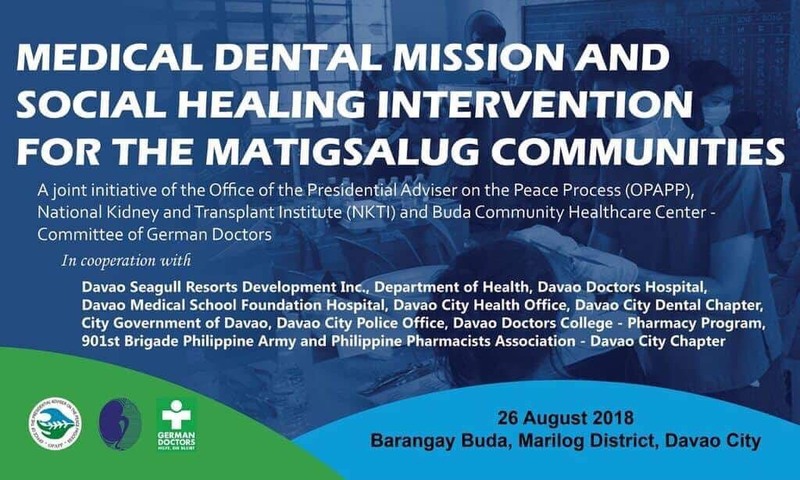 The medical, dental, and social healing mission is a joint undertaking of the Office of the Presidential Adviser on the Peace Process (OPAPP), National Kidney Transplant Institute (NKTI), and the Buda Community Healthcare Center-Committee of German Doctors. 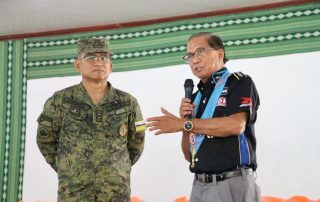 Presidential Peace Adviser Jesus Dureza said the activity is line with the national government and private sector’s efforts to provide much-needed medical and psycho-social services to Mindanao’s indigenous peoples (IPs). “This is our way of reaching out to the IP community. We would like to make them feel they have not been forgotten and are now a priority of the government,” Dureza said. He noted that a majority of Mindanao’s IPs live in far-flung, underdeveloped communities. As a result, their access to health and social services have been limited. He said this is the reason the national government’s programs aim to promote the principles of greater inclusivity and participation, especially among the vulnerable and underprivileged sectors such as the Lumad. “Our efforts must be focused on addressing the needs of our Lumad brothers and sisters. They should be given the attention they truly deserve,” he said. 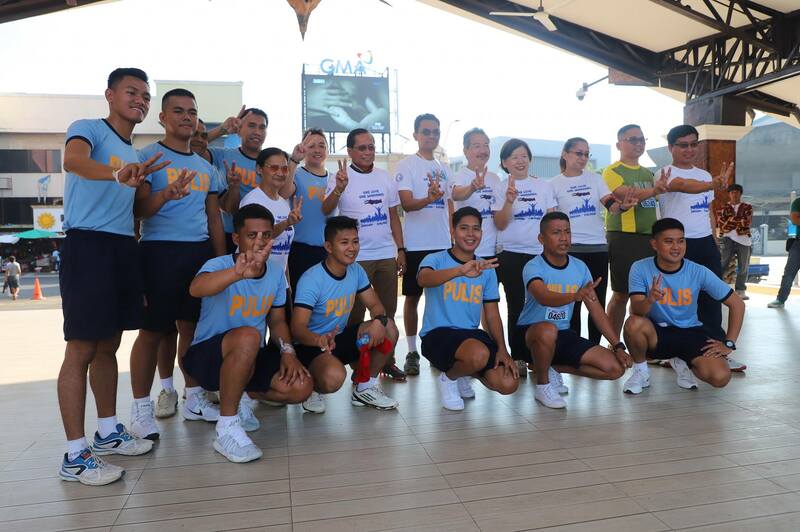 Dureza also said by uplifting the plight of the IPs, the peace and security situation in the beneficiary communities — most of which are situated conflict-affected areas — is also improved. “Peace and development should not happen one after the other but should take place simultaneously,” he said. Around 170 volunteers have signed up for today’s day-long medical and dental mission, including doctors, nurses, pharmacists, government workers, and members of the security sector. Other cooperators of the medical mission include the Davao Seagull Resorts Development Inc., Davao Doctors Hospital, Davao Medical School Foundation Hospital, Davao Doctors College – Pharmacy Program, City Government of Davao, Davao City Health Office, Davao City Dental Chapter, 901st Brigade, Philippine Army, and the Philippine Pharmacist Association – Davao Chapter. OPAPP’s Conflict Prevention and Management Unit (CPMU), headed by Director Ferdinand Jovita, will also conduct social healing sessions in the Matigsalug community. The sessions will provide a venue for residents to openly express their fears, anger, and frustrations. They are also aimed at helping victims of armed violence overcome their negative experiences. 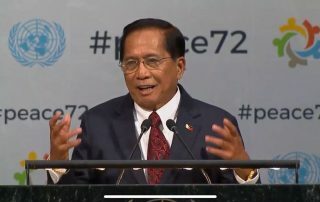 MANILA, April 25 2018 – Presidential Peace Adviser Jesus G. Dureza highlighted the peacebuilding efforts of the Philippine government as he spoke before the United Nations (UN) General Assembly in New York City today. In his message delivered during the high-level meeting on peacebuilding and sustaining peace, Dureza presented several initiatives being undertaken by the Office of the Presidential Adviser on the Peace Process (OPAPP) as proof of government’s commitment to peace. He said these include the implementation of socio-economic development programs in conflict-affected areas through PAyapa at MAsaganang PamayaNAn (PAMANA) and the development of a peace constituency through the People’s Peace Table. “As you all know very well, you cannot have peace – or you cannot sustain peace – if there is no development; and you cannot also sustain development unless there is peace,” he said. The peace adviser added that development should be done through a “peace lens,” using an inclusive approach that involves the different stakeholders of conflict. “We cannot address sustainable peace if you only attend to people who are triggers of conflict, or are involved in conflict,“ he said, emphasizing that the concerns of “the bigger table, which is the public” should also be addressed. Dureza closed his presentation by reaffirming government’s commitment to pursuing and sustaining peace in the country. He also expressed gratitude for the UN’s role in strengthening government’s peacebuilding efforts. “The work for peace is not an easy to road to travel. There are roadblocks. There are many ways, however, to peace. We cannot avoid roadblocks … but we have to stay in the course,” the peace adviser said. “Many mechanisms for peace have been in place in the country today are being supported strongly by the UN systems and the UN agencies,” he said. Dureza also recognized the importance of mediators who facilitate peace negotiations. “We have noticed that when there are foreign nations supporting the peace process, it is not too easy for the rebel groups, in times of challenging situations in the process of the negotiation, (to) walk away from the table,” he said. This was the challenge given by Presidential Peace Adviser Jesus G. Dureza to the men and women of the 3rd Infantry Battalion, 7th infantry Division, in his remarks during the commemoration of the unit’s 45th Founding Anniversary held at their headquarters here. In referring to rebels who have expressed their desire to lay down their arms and live peaceful, productive lives, Sec. Dureza advised members of the 3rd ID to give the rebels a chance to reform themselves. He pointed out that the main objective of the security sector is not to engage the insurgents in armed battles, but “to accept them” and help them make the transition to mainstream society. Sec. Dureza said he had adopted this mindset after being instructed by President Rodrigo Duterte to “talk across the tables” in order to find a long-lasting solution to the armed conflict in the country. The Office of the Presidential Adviser on the Peace Process has established various “peace tables” which aim to provide a venue for stakeholders to discuss pressing peace-related issues and come up with recommendations on how to best address them. According to the presidential peace adviser, there is a need to use a “community-based approach” in dealing with the insurgency problem in the country. During a recent visit he made in Brgy. Gupitan, Kapalong, Davao del Norte to inaugurate a Payapa at Masaganang Pamayanan (PAMANA) bridge project, he was informed by tribal leaders that the event almost did not push through after they received threats from a rebel group operating there. 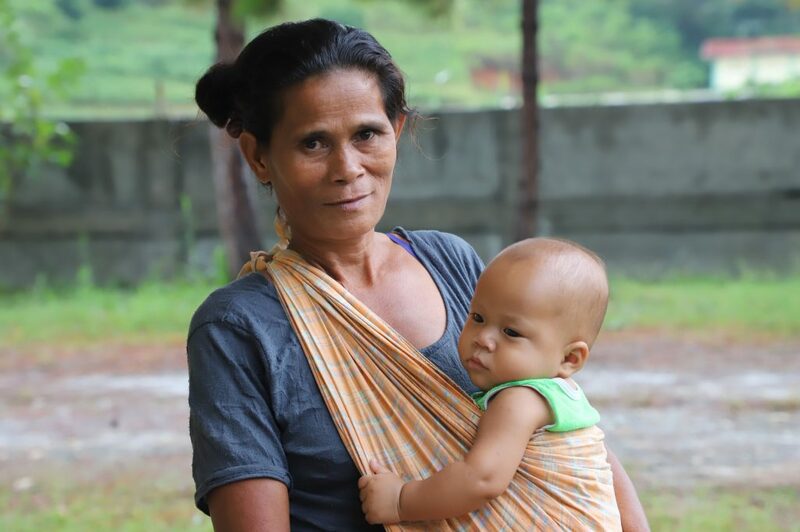 But what he found most touching was their assurance that no harm will come to him, as members of the Lumad community had secured the area themselves. “Don’t worry, we will protect you,” one of the elders told him, as he pointed to village folk who were armed with native weapons. From his conversations with the village folk, he could sense their strong desire to maintain peace and order and sustain the gains of economic growth in the community. Sec. Dureza believes in the power of diplomacy in resolving situations of conflict. He said that through diplomacy, he has been able to effectively carry out talks with the leaders of various rebels groups in the country. “Use diplomacy,” Sec. 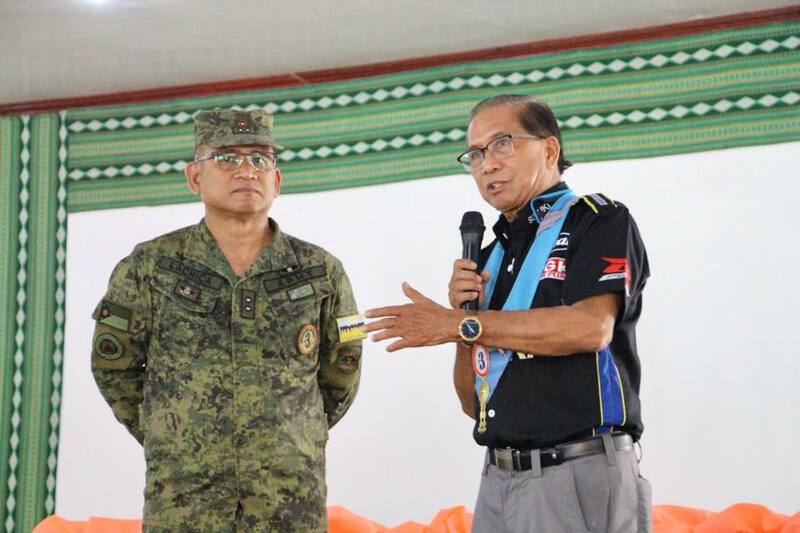 Dureza told the members of the 3rd ID, as he urged them to continue being agents of peace and development in the communities they serve.